Wake up and turn on your tunes, or party to playlists all night long. Wireless multiroom systems connect your audio sources, smart devices and speakers to eliminate clutter and confusion in your home. Play different music in each room, group rooms together, or play the same music in every room at the same time, and control it all from your smartphone, tablet or laptop. Wireless speakers are easy to place on a bookshelf, desk or table, and come in different sizes and designs, with a variety of features. You can use them inside or outside the house, as long as they are within range of your wireless network or hotspot. With so many options, you'll be able to stream music from your favorite sources, create the best sound for your space, and enhance your home décor. Once you've connected a speaker to your wireless network, you can control it with an app that can be downloaded to your smartphone, tablet or computer. Some systems come with a dedicated remote or buttons on the unit itself, ensuring easy, intuitive access to your music library and services. Include new speakers and devices in your multiroom system anytime you want. Place a compact speaker in your bedroom that can double as an alarm. Pair two speakers for stereo sound, and add a subwoofer for complementary bass. For audio with more depth and detail, add an amplifier. To hear music in more corners of your home, add adapters and extenders. If you want to improve your TV audio at the same time, add a sound bar to your system. Sound bars can make dialogue easier to understand, level out shifts in volume, and play streaming sound along with the rest of your audio system. Some brands even let you designate speakers to a specific rear channel when used with their sound bars, to simulate surround sound. Bluetooth speakers are portable, so they can travel with you wherever you go. They're great for outdoor activities where you're leaving your home network behind, since they connect to a smartphone, tablet or laptop. But music playing over Bluetooth speakers might be interrupted if you receive a phone call or text. On the other hand, Wi-Fi speakers keep streaming no matter what you're doing on your device. This is because they connect directly to your home network and deliver higher sound quality and better speaker support. They also offer a wider range of music, since you can access playlists that exist on your computer or hard drive, along with audio from the Internet. If you can't decide between the two, you can find wireless speakers that support both Bluetooth and Wi-Fi technologies. Sonos offers a system of Hi-Fi wireless speakers for every room and occasion. All you need to get started is one speaker, like the Play:1 (see below), and a wireless router to connect to. A downloadable app unites your digital audio library, so you can have music in each room, or separately if someone wants to listen to one song in the living room while you sing along to another preparing food in the kitchen. Sonos' wireless speakers install quickly over a dedicated wireless network, so you don't have to miss a beat. To create the Sonos wireless network, you need to connect one of the main components, a speaker, sound bar or other Sonos sound systems like the Bridge, to your router with an Ethernet cable. Once one of the components is connected to your router, any additional components you add can be connected wirelessly, without the need of any cable. The app can be installed on as many smartphones and tablets as you'd like, and is available for iOS and Android devices. Speakers: Sonos offers three main speakers in black or white, and each one delivers clear, robust sound. Choosing the right speaker for you depends on your room size, what you're using the speaker for, and your budget. Play 1: As the smallest Sonos speaker available, the Play:1 is great in small rooms, especially the kitchen or bathroom thanks to its humidity-proof design. It can be used in a set of two for the rear speakers in your surround sound setup for your home theater and can be wall mounted for more room customization. Play 3: This single speaker is able to separate the left and right audio channels. Two Play:3 speakers can be used as the rear speakers in your surround sound setup. Play 5: The Play 5 speaker has been engineered to make listening to digital music simpler, more immersive, and more satisfying. It combines six synchronized drivers with room-adapting TRUEPLAY tuning, able to deliver a brilliant reproduction of the music you love. Sonos Controller app: Music can be controlled wirelessly with the downloadable app from your smartphone, computer or tablet. The app lets you browse and play your music. You can also choose which song plays in which room, or play the same music everywhere in your home — perfect for parties. Adding these optional components to your Sonos wireless audio setup will expand your audio options. Sonos Boost: The optional Boost lets you wirelessly connect your Playbar to the Sub and Play 1 rear speakers to create an immersive 5.1 surround sound experience. Plus, it plugs into your home router to create a reliable wireless signal and even extends the range of your Sonos system. Sonos Connect Amp: The Sonos Connect:Amp is a full-featured digital audio system that lets you integrate unpowered, wired speakers you already own into the multiroom audio system, no matter what brand they are. It is part music streamer and part amplifier. Sonos Connect: Don't throw away your old stereo or home theater equipment; use the Sonos Connect to give your external amplifier/receiver or powered speaker system new life as part of your wireless setup. Sonos Playbar: The TV-compatible Playbar is an essential component when adding 5.1 surround sound to your home theater. 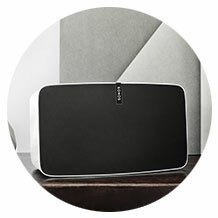 Sonos Sub: This force-cancelling sub delivers strong bass in your surround sound setup. Sonos lets you listen to your favorite Pandora or SiriusXM stations, as well as songs from Spotify your iTunes library and dozens of other streaming music services. The Controller app comes pre-loaded with TuneIn radio, a service with over 100,000 radio stations, giving you plenty of ways to explore new music and talk radio. Need help setting up your wirelesss home audio? Best Buy will send out a Geek Squad® professional to install and connect everything for you – just how you want it. The Radiant 360 wireless audio system can fill your entire home with bright, clear, omnidirectional sound. Each speaker features a trim, cylindrical design to complement any room, no matter where you place it. Ring Radiator Technology transmits audio from every side of the speaker, so any spot in the room is ideal for listening. Each speaker can stream music via Wi-Fi and Bluetooth and work with NFC-enabled devices. Sync as many speakers as you want into the Radiant 360 multiroom system. TV SoundConnect lets you pair speakers directly to your compatible Samsung TV for a home entertainment system without an inconvenient mess of wires. Plus, you can connect speakers with the Multiroom App 2.0, the same one used to control your audio, create playlists and select play modes. Once setup is complete, you can control which music plays in each room, or fill the entire home with the same audio. The app can be installed on as many smartphones and tablets as you'd like, and is available for Android devices. Speakers: All you need is a single Radiant 360 speaker to start streaming music, movie audio and more with pure, balanced sound. Pair multiple speakers together in the same room or all throughout the house to create a full home audio experience. Their unique design makes them an appealing part of your home décor, whether you place them on a coffee table, bookshelf or entertainment center. R1: Place the R1 speaker in a bedroom or office and enjoy full, detailed sound from every angle. The R1 is the most compact speaker in the Radiant 360 system, so it fits easily on a side table or desk. R3: With the same bold, upright design as all the Radiant 360 speakers, the mid-sized R3 adds sophistication to any room with the right combination of fresh style and functionality. R5: The R5 is the largest speaker offered in the Radiant 360 system, so it can project rich, vibrant sound across a spacious living area or home theater. Adding these optional components to your Radiant 360 wireless audio setup will give you more options for how you listen, watch and play. Samsung HW-J8500/ZA soundbar: This curved Samsung sound bar completes your home theater setup with 9.1-channel sound, side-firing and center-channel speakers, and an 8" wireless active subwoofer. Samsung 7000 Series HW-J7500/ZA soundbar: This Samsung sound bar features 8.1-channel sound and a curved design made for your compatible Samsung TV. The 7" wireless active subwoofer provides powerful bass. Samsung HW-J6500/ZA soundbar: This curved 6.1-channel Samsung sound bar and 7" wireless subwoofer make a sleek centerpiece for your multiroom wireless audio system. Stream music from Pandora, Rhapsody, Spotify and more using your mobile device. The Multiroom App 2.0 makes it easy to connect directly to your existing online accounts and listen to your favorite playlists. Best Buy will send out a Geek Squad® professional to install and connect everything for you — just how you want it. 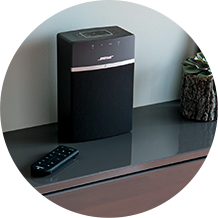 Bose® SoundTouch® Wireless Music systems bring your audio to life, letting you pump out tunes with one-touch control. Each of the six preset buttons on the three available SoundTouch music systems lets you switch to the music you feel like listening to at any given time. An OLED display means there's no need to spend time pulling out your smartphone or tablet to find track information. 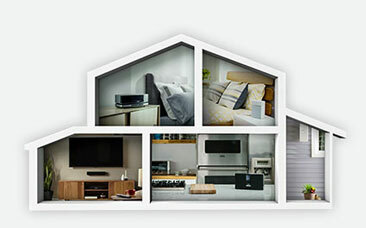 The SoundTouch system uses your existing home Wi-Fi network to bring your audio to life. 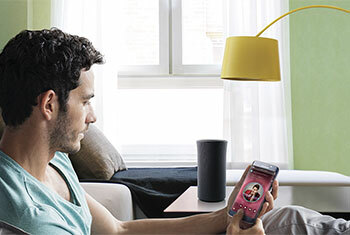 Installation is simple—the included SoundTouch app (available for your computer, smartphone and tablet) provides guided setup instructions. Once complete, you can control your music with the very same app. The app can be installed on as many smartphones and tablets as you'd like, and is available for iOS and Android devices. Speakers: The SoundTouch system lets you play music everywhere, or play different music in different rooms. From the small yet powerful SoundTouch 10 to the SoundTouch 30 Series III speakers, Bose has a speaker that will fit your needs. All SoundTouch-enabled devices work together to connect your home's audio, so you can play it where you want—even outdoors with a SoundTouch outdoor speaker system. All you need to get started is a SoundTouch device. They all connect wirelessly with a touch of a button. All speaker models are available in black and white. SoundTouch 30 Series Ⅲ wireless music system: The premier Bose one-piece wireless music system, this speaker uses Waveguide technology to fill your large living space with deep, rich sound. SoundTouch 20 Series Ⅲ wireless music system: This medium-sized speaker packs enough clear, robust sound for bedrooms, kitchens, and most other rooms in your home. 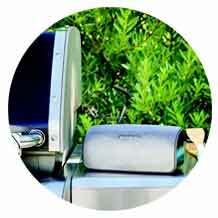 SoundTouch 10 wireless music system: The smallest SoundTouch fits just about anywhere, delivering full, rich sound. SoundTouch® app: This app gives you complete control right at your fingertips, with the ability to drag and drop your music sources to your preset buttons, browse your music library, and control what beats flow out of which speakers. Wave SoundTouch music system: One system, all of your music. The Wave streams music and your own music library, wirelessly. Plus, there's a CD player and AM/FM radio. SoundTouch home theater and entertainment systems: Both the Lifestyle entertainment system and home theater system can connect to the rest of your SoundTouch-enabled speakers to create more flexibility within your home audio setup. SoundTouch wireless adaptor: Add wireless music capabilities to your existing Bose home theater system. SoundTouch amplifier package: Transform your stereo speakers into a powerful wireless music system. The Wireless Collection is a multiroom audio system that uses Play-Fi technology, much like Polk Omni Collection. This technology lets you stream audio over a standard Wi-Fi connection and works with mobile devices, tablets and PCs. No bridges or extra accessories are needed during setup. Plus, Play-Fi products work on an open platform; both the Wireless Collection and Polk Omni Collection products work with each other. The wireless speakers play music wherever you want in your home once connected to an existing Wi-Fi network. Stream your favorite music services, Internet radio and your personal digital music library all from your smartphone, tablet or computer to the Wireless Collection speakers or sound bar. You control what plays where with a free app. Speakers: The W7 and W9 are your main wireless speakers. You can put them in your bedroom or kitchen and have each room play a different song or the same one at the same time. The sound bar connects to both wireless speakers to give your multiroom audio another dimension. W7: This is the most compact speaker Definitive Technology offers. A Tri-Polar configuration allows it to radiate sound off of surrounding walls, creating a broad soundstage. It's ideal for medium-sized rooms and bedrooms. W9: The flagship speaker of the Wireless Collection delivers the most audio range and deepest bass. The Tri-Polar feature directs sound in 3 different directions, where it bounces off of surrounding walls for room-filling sound. W Studio Soundbar: The TV-compatible sound bar adds 5.1 surround sound to your home theater and comes with an 8" wireless active subwoofer. Definitive Technology app: Control which speakers play what audio with this free app for iPhone, iPad and Android devices. Adding these optional components to your Definitive Technology wireless audio setup will give you more options. W Adapt: Use music streaming services on your existing audio system, such as your home theater receiver. W Amp: This wireless amplifier lets you use an existing loudspeakers to stream your favorite music. You can also fine-tune the amp´s EQ settings. With the Definitive Technology Wireless Collection, play your favorite streaming services like Pandora, Spotify and SiriusXM Radio. Polk Omni is a multiroom audio system that uses Play-Fi technology, much like the Definitive Technology Wireless Collection. Play-Fi technology lets you stream audio over a standard Wi-Fi connection and works with mobile devices, tablets and PCs. No bridges or extra accessories are needed during setup. Plus, Play-Fi products work on an open platform; both the Wireless Collection and Polk Omni Collection products work with each other. You can play music everywhere, at any time, with the Omni Collection. It sets up over an existing Wi-Fi network and doesn't require any extra components to start listening to your favorite music or talk radio. You can control what you listen to with the free Polk Omni app (available for the iPhone, iPad and Android devices). Speakers: The Omni Collection contains two wireless speakers: the Omni S2 and the S2 Rechargeable. Each speaker has its own unique features, and both can be connected to the Omni sound bar to add even more areas into your multiroom setup. Omni S2: This compact speaker can sit horizontally or vertically to fit in small spaces like a bathroom countertop or a crowded bookshelf. 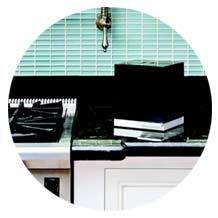 You can also swap between black and white grilles, so the speakers look stylish in any room of your home. Omni S2 Rechargeable: Don't let a power cord limit your audio experience. This speaker is portable thanks to its rechargeable battery. Don't limit your music to indoors — enjoy it outside on your patio or deck as well. Omni SB1 Soundbar: Add 3.1 surround sound to your home theater setup. A Voice Adjust feature helps you hear movie and TV show dialogue, and a 8" subwoofer rumbles during action scenes. Omni app: Download the free app for iPhone, iPad or Android devices to control your streaming music. Adding these optional components to your Polk Omni wireless audio setup will give you more options. Omni P1 Adaptor: Play streaming services on your existing audio systems like your portable devices, stereos, home theater receiver and powered speakers. Omni A1 Amplifier: Use your favorite component speakers to stream music. 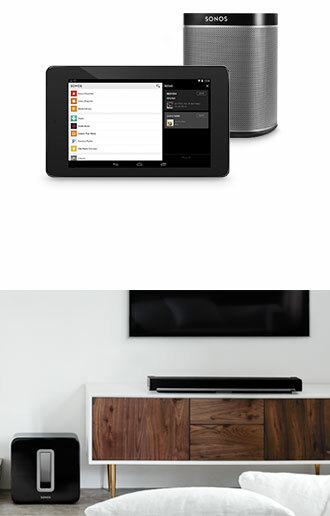 Stream the same music to every room, or stream different songs to different rooms. With the Polk Omni Collection, play your favorite streaming services like Pandora, Spotify and SiriusXM Radio. The HEOS by Denon speakers are designed to look like another piece of décor as they wirelessly stream your choice of audio, such as the intense cheering from a soccer announcer on your favorite sports radio station. Up to 32 speakers can play your favorite stations, podcasts or music, anywhere you want. Control all of your home's audio with a single, downloadable app on iOS- or Android-enabled devices. The HEOS multiroom sound system features three speakers, each designed for different sized rooms and quality levels, that you can use to stream your music, podcasts or other audio. It's all controlled via the free iOS or Android Denon Controller app. The app can be installed on as many smartphones and tablets as you'd like, and is available for iOS and Android devices. The setup process has four easy steps: 1) powering the unit, 2) downloading the app, 3) connecting to your home wireless connection via the app (no need to use your router or network cables) and 4) choosing your music. Speakers: With the HEOS by Denon system, you can set up one speaker and play content locally or multiple speakers to fill the entire home with perfectly synchronized music. You can crank up the tunes with three speaker options: the HEOS 7, HEOS 5 and HEOS 3. Remember, the smaller the number, the smaller the speaker. Denon uses MaxxAudio by Waves for its sound system, a technology used in recording studios, to achieve its powerful sound. HEOS 3: This speaker is great for areas like kitchens, so you can catch up on items like the day's news while you prepare dinner. Two portable HEOS 3 units can also be used to create a stereo pair, and can be placed horizontally or vertically. HEOS 5: This mid-level speaker can fill your dining room with serenading dinner party music. HEOS 7: Most suited for open areas,this is also the speaker with the deepest bass, meaning you'll get more immersive sound out of your favorite bass guitar solo. Controller app: Choose your music source via the simple, easy-to-use iOS or Android app. You can check your music queue to see what's playing next, pick a music source and browse different songs to add to, say, your home workout or cleaning playlists. With optional components, like the HEOS Extend, you can get more out of your HEOS by Denon wireless audio system. HEOS Extend: This range extender will strengthen the entire home network for all Wi-Fi devices, giving you more flexibility for where to place your speakers. HEOS Amp: This wireless amplifier will give your stereo speakers multiroom audio functionality. Plus, you can connect a powered subwoofer, a CD player and many other devices. HEOS Link: Add multiroom audio to an existing music or home theater audio system. Stream favorite cloud-based sources like Spotify, Rhapsody, TuneIn and Pandora. Plus, listen to tracks directly from your phone, tablet or USB drive. Additional services available. The Sony multiroom system lets you stream music and set up your home audio exactly the way that works for you. Find the right speaker for each room and then connect them all to play the same music throughout the house, or different music in each room. Sony's Hi-Res Audio elevates the quality of the music you play, almost as if the artist is performing live right in front of you. You can even connect speakers to a Sony sound bar and create a home theater experience with surround sound. Simply download the SongPal app to your smartphone or tablet and connect your Sony speakers over Bluetooth or Wi-Fi. You'll have access to all your playlists, whether they're stored on your home network or a mobile device, plus you can stream your favorite online music services. Google Cast lets you easily access music, online radio or podcasts. The app is your remote control for multiroom listening, balancing audio and more. Speakers: Sony wireless speakers are equipped with Bluetooth and Wi-Fi technology, so you can integrate them into your multiroom system, or bring them with you on the road. SRS-ZR5: This compact speaker delivers enriched sound and a clean design. Place it on a bedside table, office desk or kitchen counter and connect it with other speakers for wireless surround sound. SRS-ZR7: This horizontal speaker plays powerful audio with a 2.2-channel speaker system and is wireless surround sound capable. From pure and crisp vocals to complex melodies and resounding bass, it will upgrade your listening experience. SRS-X88: This minimalist wireless speaker works in the kitchen, living room or bedroom with 7-way speakers and 2 passive radiators. You can listen to your music library whether it's on your smartphone, PC or via a music service. SRS-X99: Add this intuitive speaker to your multiroom system to fill your home with precision sound. You only need one of these speakers for a large room, since front- and top-mounted super tweeters broaden the listening range to a wider field, for a more immersive experience. SRS-HG1: This Bluetooth speaker can join your multiroom system and produce wireless surround sound, or you can take it with you on the go. Choose from a range of distinctive colors to fit your style. SongPal app: Let the same great song follow you around the house and turn different speakers on and off when you want. The SongPal app lets you group your Sony speakers and sound bars together and then control them from your smartphone or tablet. Adding these optional components to your Sony wireless audio setup will expand your audio options. HT-ST9: Together, this sound bar and subwoofer offer virtual surround sound using Digital Signal Processing and Wave-front technology. HT-CT790: This 2.1-channel sound bar delivers balanced audio and adds more body to bass, putting you right in the middle of the action while you watch your favorite movies and TV shows. HT-NT5: This sleek sound bar lets you experience the sonic details of every movie, playlist and video game. You can also add Sony wireless speakers as rear surround sound speakers. HT-XT2: This one-piece sound bar with built-in subwoofer brings powerful sound to any room and is compatible with other Sony wireless speakers to help you expand your home theater. BDP-S6700: This streaming 4K upscaling Blu-ray player with built-in Wi-Fi can be used as a hub for your multiroom system. Connect it with the SongPal app to get started. UHP-H1: Set up your home theater system and enjoy outstanding detail and incredible sound with this Sony A/V player. Add it to your multiroom audio system using the SongPal app. Sony lets you listen to your favorite online streaming services like Pandora, Spotify and more. Plus, you can enjoy playlists from AirPlay-enabled devices, access more audio using Google Cast, or play music you've stored on your home network or computer with a DLNA connection. Need help setting up your wireless home audio? 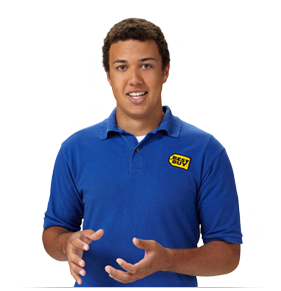 Best Buy will send out a Geek Squad® Agent to install and connect everything for you – just how you want it. Find wireless multiroom audio systems at BestBuy.com. 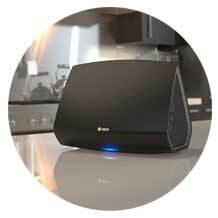 Your local Best Buy store also has a selection of wireless audio systems for you to explore. Plus, our friendly Blue Shirts are there to answer questions and help with choosing the best audio solutions for your needs. If you're looking for other types of wireless audio, check out the Portable Speaker Buying Guide.